Yesterday my kids took out an old box from the back of the sideboard which had (a slightly broken) Go for Broke. Go for Broke was one of my childhood favourites. With Christmas around the corner it is a great time of year to dig out the old traditional board games. I have such fond memories of playing numerous board games as a child. My own kids are just reaching an age where playing a board game will not end in tears or pulled out hair. Watching them play brought back so many memories and I started reminiscing about my other favourite board games. So I have decided to share them here. Maybe you can even pick up one or two and have a few fun family games around the table over the festive season. The game where you win by spending a million. Simple as that – until you find you win the Lottery or a long-lost Uncle leaves you €100,000 inheritance! Certainly the stuff of board games and not reality. So much fun betting on horses, playing roulette and spending as much as possible, as quickly as possible. My kids had a blast but are probably a little young. I had a million questions. “Mammy, how much do I have to pay to bet on horse number 2, “What does this say?” etc. To be fair the game box does say age 8+. So one for the older kids. I have fond memories of playing connect 4 as a child. So easy – just get four counters in a row. A take on the old traditional noughts and crosses or 3-in-a-row, Connect 4 is a fun game and I think I will be investing in it very soon. My kids can all count – they would love it. Another favourite of my childhood that my kids have had a go at in their Nana’s house. Trying to guess the person on your opponents card through asking questions about their appearance. Do they have blue eyes? No, then eliminate all blue-eyed characters off the playing board. Do they have a hat? Yes, keep all hat wearers. Simple fun! I loved Game of Life as a child. Ever eager to grow up and have my own life it allowed you an imaginary journey through life: get married, have kids, pick an exciting career. We always had a great laugh as a family around the table playing Game of Life. Monopoly is such a classic game. Growing up I lived in Zimbabwe for a number of years and we ended up with the South African version of Monopoly – so we had Bloemfontein station and properties in Cape Town and Durban to manage. 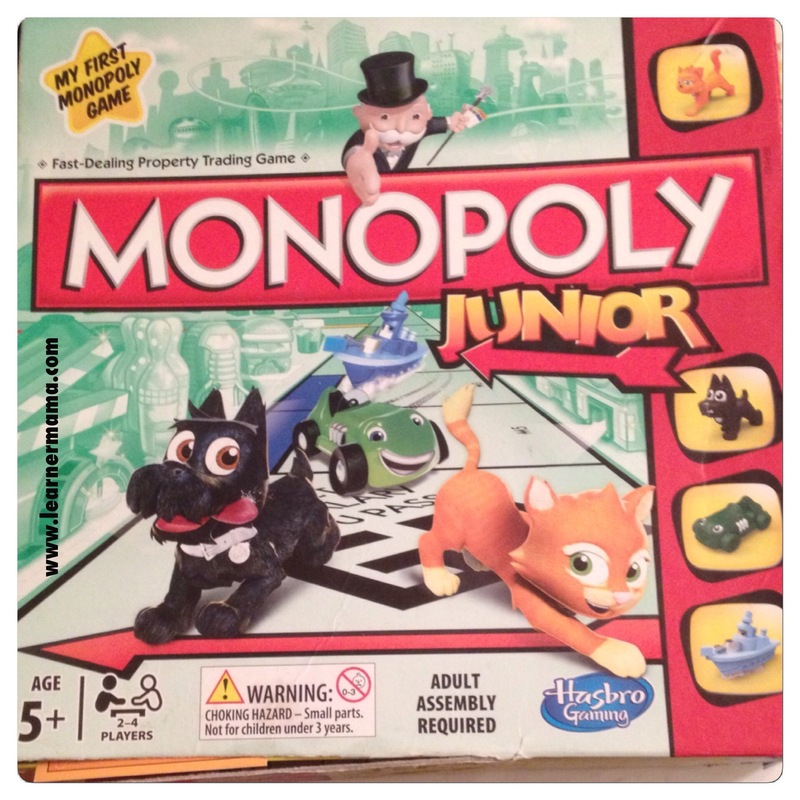 This year my little man got Junior Monopoly for his birthday and the kids have had a lot of fun with it. 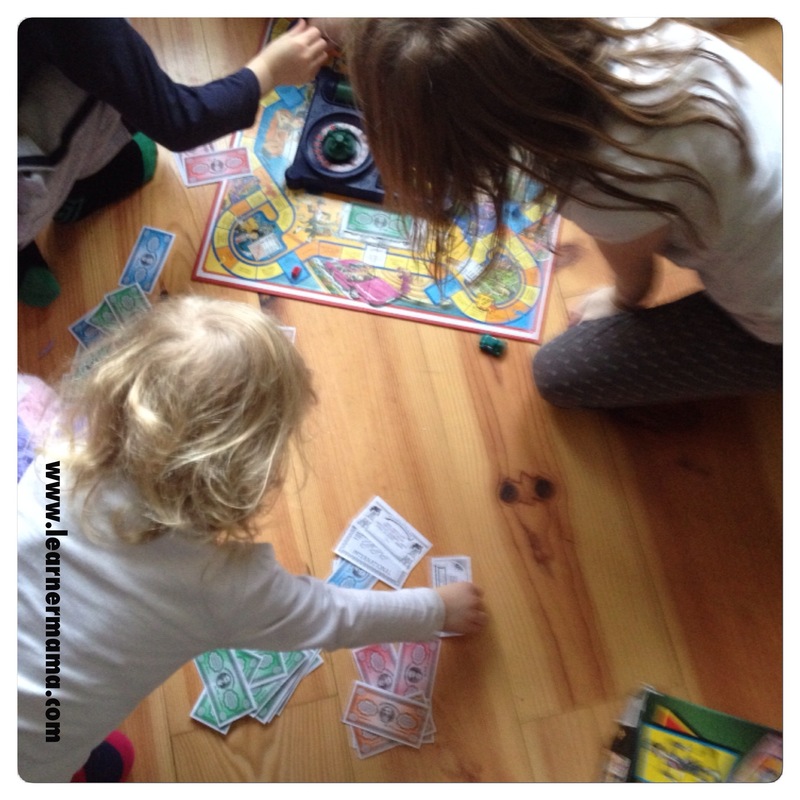 Probably a bit soon to move to the classic version but having them sit and play a game of Junior Monopoly is so lovely to watch. Really one for the adults as I got older I used to love just reading the questions and seeing if I knew the answers. There was card after card all neatly stacked in the slim little box. I never did know many answers, but I learnt a lot! I think my parents still have the 1980’s version of Trivial Pursuit in their house which makes for interesting questions at Christmas time! Maybe it’s time for some Junior Trivial Pursuit in this house. My daughter’s school report did say she has a thirst for general knowledge! 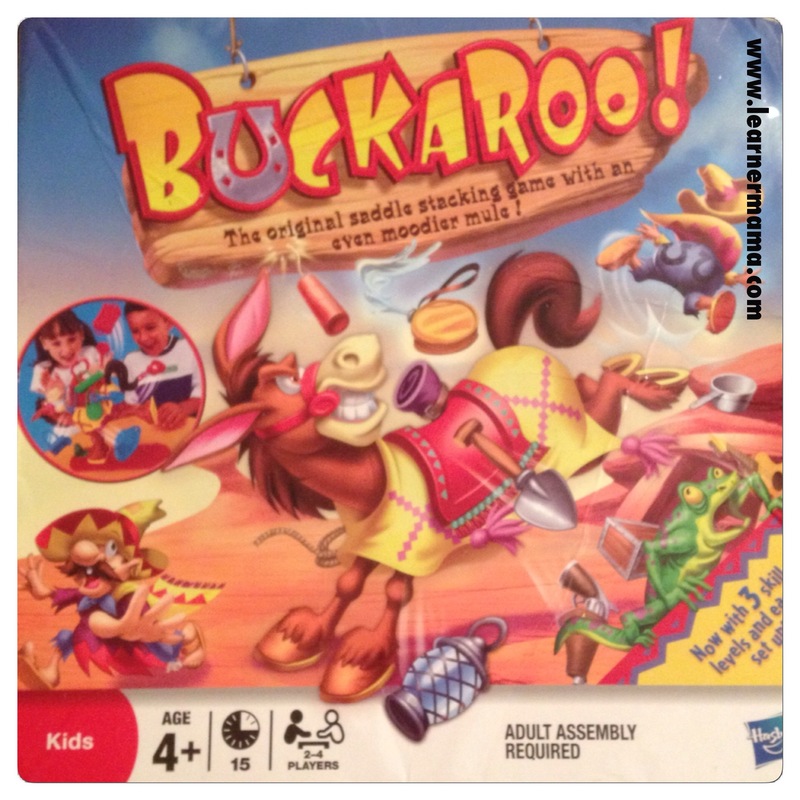 I didn’t have Buckaroo as a child but always wanted it as many of my friends had it. I think I may have been a little excited when my son got Buckaroo last Christmas from a family member. It really is a classic. For the kids the anticipation of the horse kicking off as they carefully place an item on his saddle is hilarious. Oh how I loved operation. The anticipation that you might hit off something and the alarm would sound giving you an awful fright and a right laugh! We had hours of fun with our 1980’s operation. My mum recently bought a new one for the grandkids to play when at her house and they love it. They seem to have the same anticipation and same fright when they hit off the wrong place. The fits of laughter are amazing. For me though, maybe it’s because I am older, it seems so easy now. I am actually not a fan of Scrabble, my vocabulary is not extensive enough to be any good at it. As a child, however I loved Junior Scrabble. It was simple words and loads of fun. I’d probably enjoy a game of Junior Scrabble with my oldest girl. The other two are still a bit young! I love Cluedo. 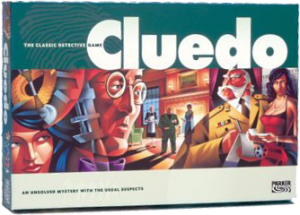 I loved playing it as a child and one of my all time favourite films is Clue. The movie based on the board game from 1985. I still have it on VHS and my husband bought me the DVD for Christmas a number of years ago as well as a modern version of Cluedo board game involving a DVD to follow through the game. To be honest I wasn’t as much of a fan of the DVD based board game. Give me the classic Cluedo any day! It was Professor Plum, with the candlestick, in the Kitchen! Do you have any favourites? What board games will you be playing with family this Christmas? Or do you avoid them like the plague?! Thanks – never played those three! Must check them out. Actually, my husband is a big board game fan. He loves scrabble the most, though, and can’t wait for our girls to get old enough to play. One of my girls seems to be taking after him and a game called ‘Dino Bite’ is on her wish list this year. I’m sure we’ll all enjoy that at Christmas. Drunken Operation sounds right up my alley 🙂 Never heard of Dino bite but it’s great when they get old enough to enjoy them! Oh I loved Cluedo so much! 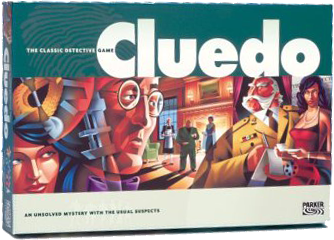 Hours and hours spent playing it – it tied nicely with an Hercule Poirot obsession. I’ve never played Monopoly or Game of Life – may need to invest in those when the kids are a tiny bit older. Massive Game of Life fan here, as well as Monopoly – the arguments that used to break out regarding our no-nonsense attitude to rent payment! I was always useless at Operation, so Sadhbh’s version would have me much worse very very quickly! Lisa-Four Walls, Rainy Days recently posted…Foodie Friday: What am I doing?